The happenings in Abia State in the last one week are quite worrisome. They are an absurdity in our democratic and political development as well as a clear misapplication of law to wreak havoc on our otherwise fragile polity. It started with the judgment of Justice Okon Abang of the Federal High Court sitting in Abuja last Monday. In the judgment, the court held that Governor Okezie Ikpeazu falsified his tax documents tendered to his Peoples Democratic Party during the governorship primaries and as such he lacked the qualifications to have contested the primaries at all. As an advocate of tax justice and the need for citizens to not only pay personal income taxes, but also appropriate taxes, the basis for the disqualification is of great interest to me. I am excited that the courts have come to assign adequate weight to the importance of tax payment by every citizen, nay, those who seek to lead others. This is because ultimately, an elected public officer is responsible for judicious management of public funds for which taxes make up a huge part of. But whether the court took adequate and appropriate steps to properly assess the authenticity of the tax papers tendered by Ikpeazu before reaching its decision is still subject to debate and further decision by the appellate court. Justice Abang thereafter asked the governor to vacate office. He held that a certain Uche Ogah, who came second to Ikpeazu in the PDP primaries ought to have been the party’s standard bearer in the April 2015 election and should therefore replace Ikpeazu as governor. Ogah therefore got what amounts to double promotion in one day; first as the PDP candidate and second as winner of the last governorship election in Abia. 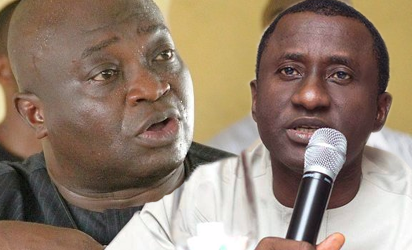 In the wisdom of the court, whatever votes and therefore the electoral victory recorded by Ikpeazu and the PDP in that election are by legal fiction, some form of bequest to Ogah; and having so been bequeathed, Ogah should be given the position of governor. The court therefore assumed that if Ogah had been put on the ballot, he still would have beaten all the candidates in the election, just as Ikpeazu did. This argument aligns with the Supreme Court ruling in 2007 which granted the Rivers State governor’s seat to Rotimi Amaechi. Recall that Amaechi had been unfairly denied a chance by the same PDP from being its candidate after he won the primaries. The court later handed over the PDP victory that had Celestine Omehia as candidate, to Amaechi. I remember criticising that decision of the Supreme Court on many grounds including the fact that a political party was being rewarded for its wilful manipulation of the electoral process. I also questioned the legal and factual bases for assuming that Amaechi as candidate would have won the majority votes of Rivers State electorate. I held then, and still hold, that the judiciary cannot possibly attempt to speculate how the electorate would have voted on Election Day. I thought that at best, the court should have ordered a fresh election among those who ought to have been candidates. Otherwise, the court should have rewarded the candidate who came second after the disqualified candidate; more so to punish the political party for its irresponsibility. Apparently, the legislature agreed with this argument which was canvassed by several other experts and commentators. The National Assembly therefore reflected that in the amended Electoral Act which now states that a person cannot assume an elective office unless he/she takes part in all the processes of election, namely the party primaries and the general elections. On that score alone, I believe that Justice Abang erred in making the consequential order granting the governorship seat to Ogah. Even though this suit was a pre-election litigation, the court cannot shut its eyes to the provision of an existing legislation which defines the nature of benefit the plaintiff sought. The above however is but a minute fraction of the absurdity playing out in Abia State since there is a chance to address those facts at the Court of Appeal and ultimately at the Supreme Court. However, the real absurdity is the attempt to make any further decision of the upper courts nugatory by the actions of some officials. It starts with the decision of the Independent National Electoral Commission to proceed to issue the certificate of return in the April 2015 election to Ogah, presumably on the strength of Justice Abang’s order. In doing so, two days after the order and a day after Ikpeazu had filed papers to appeal the judgment and served the notice thereof on INEC. In its eager beaver attempt to obey Justice Abang, INEC shut its eyes to the extant provisions of the laws. By our laws, a party to a suit in a high court has unfettered right to appeal the judgment to the Court of Appeal and Ikpeazu has clearly exercised such a right. Where that happens, the wisest thing to do is to allow the appeal proceedings to be completed before execution, especially where the appellant is already the one in possession of the “res” or the material being challenged or sought by the other party. I expected INEC to be mindful of the letters of the Electoral Act which provide that where an election is annulled, the person who was earlier declared as elected is allowed by law to appeal the judgment and when the person appeals, he/she remains in office until the appeal is determined. In the instant case, Ikpeazu, the person who was earlier declared winner and is in office has in fact appealed against the judgment ousting him. When the election petitions tribunals nullified or upturned the elections of several state governors, I found myself explaining to many in my circles why the incumbents had to remain in office until the final decisions by the highest appellate court. The fabric of public order and sanctity of public offices could easily have been polluted or eroded if the incumbents were removed and their opponents put in office, only for a higher court to upturn the judgments and the earlier governors again brought back. It is even still possible for the Supreme Court to also upturn the decision of the Court of Appeal. In such a situation, the state would certainly suffer for the governorship musical chairs, knowing that each “new” governor has all the full powers of governor, including the power to compose and dissolve the state executive councils etc. Just imagine the confusion that could have befallen us if Aisha Alhassan had been sworn in as Taraba State governor after she won at the election tribunal against the incumbent governor, Darius Ishaku, on November 7, 2015 only for the Court of Appeal to upturn that judgment on December 31? In fact, we need not travel far to Taraba State to imagine such a scenario. In the same Abia State, Alex Otti of the All Progressive Grand Alliance was on December 31, 2015 declared the duly elected governor by the Court of Appeal. He was not sworn in to replace the incumbent, Ikpeazu, who appealed to the Supreme Court and eventually won back the seat. It is appalling therefore that INEC issued a fresh certificate of return in the present circumstance and there seemed to be a readiness by Ogah to quickly present himself for swearing-in as state governor, but for the action of Ikpeazu to seek and obtain a high court order to put a stop to any purported swearing-in. As the week drew to a close, Ikpeazu quickly declared Friday and Monday as public holidays, ostensibly to further thwart any attempt to swear in Ogah. Now, Tuesday and Wednesday are national public holidays to mark the end of Ramadan. It follows that residents of Abia have suddenly found themselves shut out of certain public services including banking for a period of four consecutive working days. This, for a highly commercial state and happening also at the end of the month where public servants may be expecting their salaries, is an added burden on citizens, just because of the political scheming of some politicians. Whoever is behind this absurdity in Abia certainly does not have the interest of the state at heart. The person further lacks knowledge of the letter and spirit of our laws as well as the duty of our legal system to preserve law, order and stability.